Manchester United striker Robin van Persie can be sidelined for about a month, after suffering an injury during United’s 2-1 defeat to Swansea City last week. The Dutchman is thought to have damaged his ankle ligaments. The news of van Persie’s injury is expected to be confirmed in manager Louis van Gaal’s lunchtime press conference on Friday. United are still unsure about how long the striker’s recovery would take, but initial reports suggest it could be around three to four weeks. The 31-year-old picked up the injury after an awkward fall while crossing the ball. 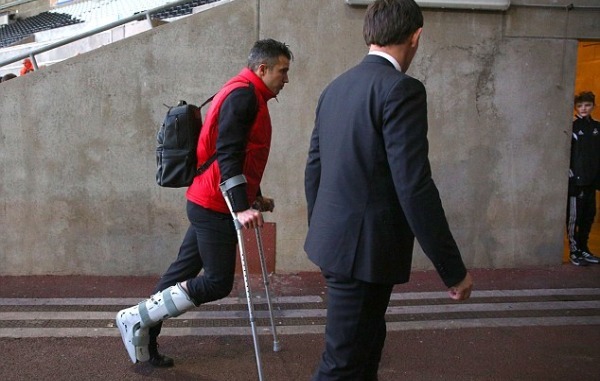 He had to hobble around the rest of the game as United had used up all their substitutes and was later photographed leaving the field on crutches. The injury will add to United’s woes as the Dutchman, despite being in poor form this season, is United’s top scorer this season with 10 goals. Expected to be out till early April, the striker will miss United’s FA Cup tie against his former club Arsenal on March 9. He has already missed a few games this season owing to ankle injuries. Van Persie’s absence will mean United’s striking options being reduced to captain Wayne Rooney, out-of-form Radamel Falcao and 19-year-old James Wilson. Ruled out RT @curlywoade02: @physioroom any news on van persie?